Dlone is the most royal king in appearance, and the most good looking. I feel that [link removed] is a good example to draw inspiration from for Dlone Kynazarr. Dlone’s chin is more triangular than [removed], and has a stronger jaw. Dlone has very angular features. He has a short, straight hair beard which is black, but the chin strip are long grey hairs, and is a very obvious feature. Dlone is also a really huge man, he isn’t as bulky as Eloden, but his muscles are huge. He is easily the most physically strong of the kings. For Dlone, we are basically talking super hero level muscle definition, almost Hulk like. 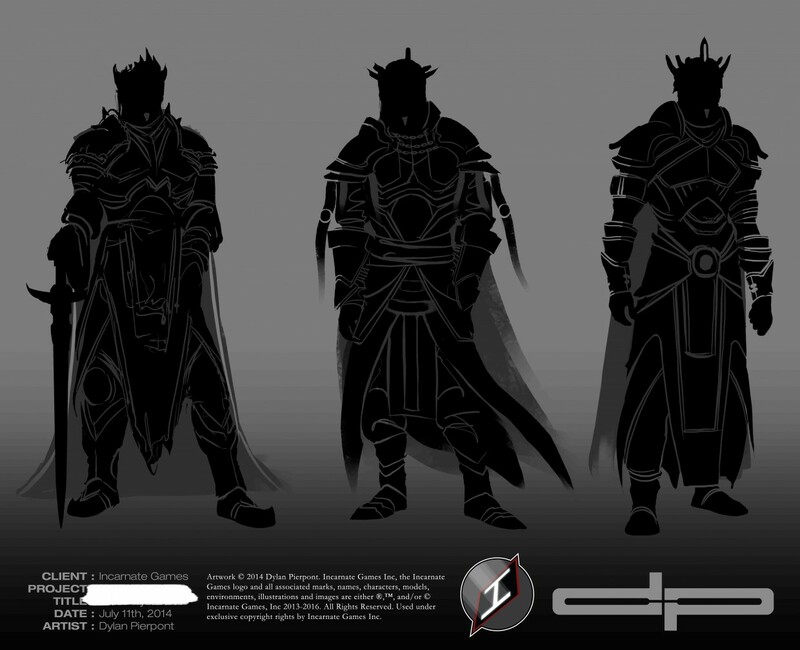 However, his crown still needs to be able to slip over his arm for him to be able to turn and lock it into place, a feature of his custom armor. He wears a traditional crown, the kings red mantle (cape), and any other typical regalia. He is the only king wearing full plate armor. His armor is a shade of red/burgandy, that is trimmed with gold. Incorporated into his armor is the symbol of the “Golden Rose” (alchemical symbolism). I imagine this is some sort of gold lined design, where it is on the armor and how big it is doesnt matter so much, as long as it is visibly identifiable as a golden rose. As far as the style or inspiration for this armor, I have to defer to the more visually creative, all I know is that there will be gold and Pyre (ruby) gemstones stylishly inlaid to the armor. Dlone uses a sword. I want the sword to be symmetrical across the long axis (straight dual edged). This sword can be either a greatsword or a long sword. I would like to see both. Perhaps create one with the greatsword, another with the long sword, and the last a long sword with shield, for the three concepts. The shield will have imagery related to fire and/or furnaces and/or other “Pyre” related imagery from the Mysterium. I would also like to see one of him wearing the crown, the crown locked into place around his arm, and then one of him wearing a second style of crown (maybe thats less conventional). There is literally no reason I couldn’t use any one of these. Damn. These are so good! Lol I like how you showed the grey chin strip in the concept, freaking awesome. The vestment choices that you coupled with the armor are all so well done, I don’t know what to do. Haha great work man. Thanks! That’s always a good position to be in when you can’t decide what to go with. I like bits and pieces of all three, So I imagine, as with some of the other kings, we might end up doing a combination.Cool idea to have the crown twist and lock onto his arm armor. That would be a really fun animation to see on-screen. I’m not sure what it does after that, but the action alone would be impressive to watch. Stay tuned for EPISODE # 005: Revenant Concepts which will be posted soon!